Comments: Andy Seto's incredible artwork graces yet another Kung-Fu Comic from ComicsOne. Slowly but surely, there's a new kind of comic book creeping into the English-speaking mainstream. You may start noticing these graphic novels in your local bookstores. They feature a wide variety of genres, from science fiction to historical adventures, and many of them are influenced by classic films just as much as they've influenced new films. I'm not talking about manga or manhwa (Japanese or Korean comics, respectively). No, I'm referring to the sudden deluge of comics from that other Asian country - China. Leading the pack in terms of domesticating Chinese comics (especially the genre known as "Kung-Fu Comics") is rising publisher ComicsOne - sure to be a dominant force in the English comic book industry as such books catch on in North America. Unlike their other Far East brethren, Kung Fu Comics are typically released in full color. However, the similarities between Hong Kong and Japanese or Korean comics are many, including a mind-boggling attention to detail, complex stories, amazing fight scenes, and an emphasis on the fantastic. Andy Seto, the artist for The Story of the Tao, is one of the top illustrators in the field, and he is currently working on a comic book interpretation of Crouching Tiger, Hidden Dragon. After seeing his artwork up close, I can see why he'd be entrusted with such a high-profile title. To put it simply, Seto's artwork is incredible. Stylistically, The Story of the Tao tends to stay realistic, though there are some funny moments where he breaks the tension and inserts some super deformed scenes of characters to exaggerate an emotion. Everything is depicted with fine lines and exceptional detail, and the coloring really helps bring his drawings to life. His talent for presenting action is hard to miss, which is important considering this is a Kung-Fu Comic. After all, what kind of Kung-Fu Comic has boring fight scenes? I mentioned the visuals of the work first because they are the most attention-grabbing aspect of the work. My biggest beef with this edition of The Story of the Tao is the translation and editing. I'm not sure if it's reflective of translating Chinese into English, or just a rushed job, but the writing for the series makes it hard to follow the action. There are frequent typographical errors and plenty of instances where a passage simply doesn't make sense. Most of the book sounds like a dub of a Kung-Fu flick recorded in the 70's and comes across awkwardly at best, but just plain confusing at worst. The volume begins with a sort of prologue to the rest of the series, where we learn that there is theological unrest in the land of ancient China. Buddhism, Taoism, Mysticism, Shinto, and many other faiths are competing with one another for religious supremacy while each of the faiths become weaker and weaker over time. A group of leaders known as the Four Saints, each the head of one of the four primary religious factions, is working to bring humanity back to morality and away from their sinful behavior. So far, our main protagonist is Datura, the current master of Buddhism, and quite the womanizer. Only Datura and Master Mao, the leader of Tao faction, have been introduced by the end of volume one. Both are young, but Datura seems to be a pleasant, cheerful guy whereas Mao is a hard, cold woman. There is evidence of a terrifically entertaining epic here, but it's hard to tell given the version we have available here. The book has been flipped to read from left to right, except for certain pages, which for some reason or another remain unchanged. While I always prefer to keep things they way they were, I'd also appreciate it more if the publisher could just pick a standard and go with it. When the page is supposed to read in a different order than usual, there are little arrows telling readers which order the panels should be read. Of course, I only see those little arrows after I've finished reading the page, and so I typically have to reread each page a few times to actually figure out what's going on. I can handle reading from right to left, and I can read from left to right, but when the direction changes mid-book in an arbitrary nature...that gets old fast. Aside from the unpredictable flipped-ness of the work and the frequent language-based errors, this is a well-presented graphic novel. It's larger than average (7x10") and boasts a glossy cover with some excellent illustrations, and it's priced lower than most manga, at an affordable $13.95 a volume. There are character profiles and histories included in the book, as well as full-color previews of other series in ComicsOne's catalogue. 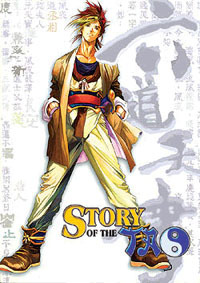 Anyone who appreciates comic books and Kung-Fu movies should enjoy The Story of the Tao. There are some technical difficulties as the series begins, but hopefully, ComicsOne will begin to devote far more time to editing works before their release - or perhaps they'll hire a crew of people to rewrite their titles before releasing them. Even with clumsy writing, I can tell that this is a series I'd love to get into, and with a more skillful presentation of the story, The Story of the Tao would become irresistible. With luck, we'll see some changes as the revenues these titles bring into ComicsOne are invested in a larger domestication crew.